For each of us, for those who are here and those who once were here, a star twinkles in the sky. So it is that the stars tell all the world’s stories. They are our legends, emblazoned in vermilion on the leaves of the book of the night. And this is a book that tells of a starry way leading to Galicia. Now Galicia was dreamed as a fertile bed of stone on which everyone would embrace his own star, on which life and hopes would cling to each other. This music was conceived on that starry way and in this embrace. The indomitable wind, the piper-wind, playing through the throat of the soul. The singing voices of a thousand-year-old radio channel. Nostalgia for the future. The ancient myth that beats with the heart of a child. The dawn song that defies death, and the ballad that lulls death to sleep. The harmony of opposites. The secret flower in every song. The tribe, ever constant. The magical tavern in every port. The pattering of the rain on the window-panes of loneliness. The music of the sea, licking the deepest wounds. 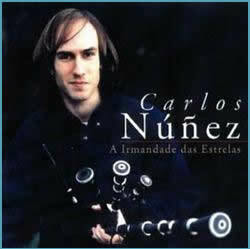 And all of this has been conjured here by Carlos Núñez in this brotherhood of stars. Just as it was first dreamed, here Galicia is America, The Celtic sea of Ireland, the warm sound of the Gypsy guitar… Galicia is Galicia when it is all worlds. A hearth around which dreams become music so as not to perish from the cold.